The aircraft carrier CVN-65 Enterprise was powered by eight Westinghouse A2W pressurized water reactors (PWR) and providing four General Electric steam turbines with 260,000 shp [shaft horsepower]. The A2W reactor is the nuclear reactor on the USS Enterprise (CVN- 65), the first nuclear powered aircraft carrier in the world. The A2W reactor was used in USS Enterprise, which had eight, while the A3W was the reactor intended for USS John F. Kennedy. The acronym stands for: A = Aircraft Carrier; 2 = second generation ( A1W was the prototype of the Idaho National Laboratory); W = Westinghouse the primary contract holders for the construction of the reactor. The four drive units on the USS Enterprise have two reactors with the designations 1A - 1B, 2A - 2B, 3A - 3B and 4A - 4B. 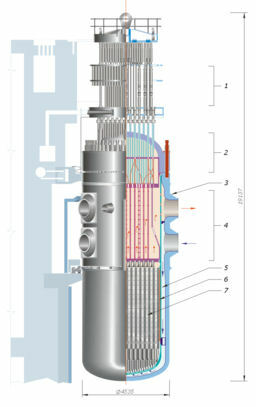 Each drive unit can be operated with a single reactor, in which case most of the energy required for the ship's propulsion. The United States Navy proposed to remove the reactor compartments of USS ENTERPRISE (CVN 65), hereafter referred to as ENTERPRISE, at Puget Sound Naval Shipyard & Intermediate Maintenance Facility (PSNS & IMF), prepare the reactor compartments for disposal as reactor compartment packages, recycle the remnant hull sections, and transport the reactor compartment packages to Trench 94 for disposal at the Department of Energy Hanford Site (Hanford). ENTERPRISE was expected to arrive at PSNS & IMF, at Bremerton, Washington, already defueled and under tow, in about 2017. The preferred alternative would require about six to eight years to complete. The reactor compartment packages would look similar in size and weight to those of the cruiser LONG BEACH evaluated in USN 1996 and will be handled similarly. Naval reactor plants are composed of corrosion resistant nickel iron alloys. Naval reactor fuel is designed, built, and tested to ensure that fission products remain contained within the fuel. After defueling, about 99.9% of the remaining radioactivity in the reactor plant is within the corrosion resistant structural alloys forming the plant as activated atoms of iron and other elements within the metal alloy. The remaining 0.1% is smaller particles deposited within the corrosion resistant piping system internals of the reactor plant. Cobalt-60, a strong gamma emitter, remains the major source of radiation but is almost completely decayed in 50 years. Nickel-63 remains after 500 years but is a weak beta emitter.